Discussion in 'Salvaged Topics' started by Baramundi Bob, May 8, 2014. Well what a day today turned out to be the lads had had a nice day the conditions werent brilliant by any means with a fairly stiff southwest wind but the lads worked hard and some nice cod and good sized ling came aboard but it was right at the latter end of the day that got everbody dancing about on the deck. I said to the lads its last drop and then home time everybody dropped down includeing barry who had started to nail a nice few fish in the latter of the day he said i fancy a big one on this drop paul and i said you never know barry barry dropped his 6" rubarb and custard sidewinder down fingers crossed what happened in the next 25 minutes was true to the word barrys rod got as good thump the next thing his reel was peeling line off something big had taken his lure . Barrys face was picture what the hell have i got on here paul i said i can guess but lets get the fish moving off the bottom barry allways has his clutch set in case he hits a big one and yes thank the lord in this case perfect no clutch set and his line would have bang barry managed to get the fish moving but no sooner had he got it 50-60ft off the bottom down it went like bullet this happened 4 or 5 times till he got it to the surface i was waiting with the gaff to come into view i knew it had to be 50 lb plus by the way barry was struggleing with it sure enough when the fish came to the surface my hunch was right a fantastic fish barry was still shaking he couldnt beleive his eyes he was over whelmed a fish of a liftime the lads onboard all shook his hand he played that fish like pro very well done barry . His rod was Shackespeare uly stick 20-30lb class and his reel was a Penn 320 GT and again the 6" rubarb and custard sidewinder does the buisness . 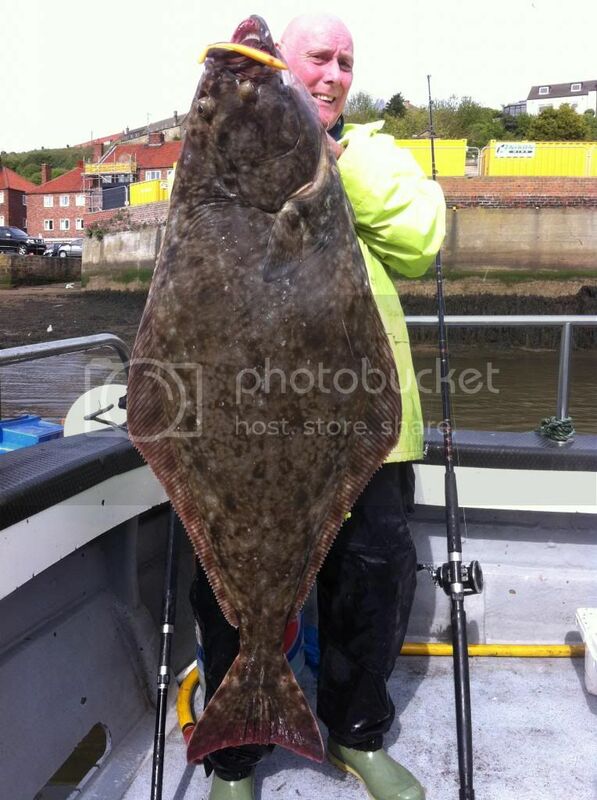 Barry Kemper with his prize halibut barry strugglers to hold it what a fish. What a fish well done barry.